Chris founded his landscaping business in 2001. Chris and his team are dedicated and passionate about landscaping schemes of all scales. The team have a genuine, friendly and professional manner which will guide you through all stages of your project, carefully listening to your ideas and offering there expert guidance and advice to turn your vision into reality. Chris specialised in plant biology at the University of Bangor. 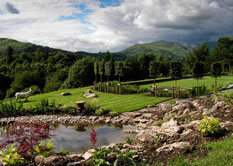 Following his degree, he founded his landscaping business and took a year long course in garden design at the Welsh College of Horticulture. 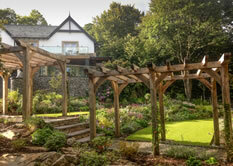 Chris's experience encompasses the design & build of gardens from town garden to country estates. Chris is always searching for new ideas and regularly visits show gardens and flower shows to keep on top of current trends. He is always up to speed with the latest building and landscaping techniques and researches new products to give longevity to his gardens. The key to Chris's success is his personal touch and attention to detail on every project. He works in close contact with clients both during development and after the project is complete. The design work is lead by Kirstyn Fox, Kirstyn joined Chris Rabone Landscapes over a year ago and has designed some of our best projects. Kirstyn started her career as landscape architect twenty years ago when she graduated from Heriot Watt University in Edinburgh. Gaining invaluable experience as a landscape architect working in Asia, Australia, London and Cumbria, Kirstyn has now found her niche as a local garden designer. 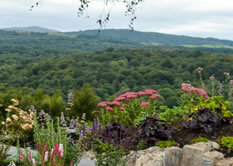 Working on a voluntary basis at Levens Hall with Head Gardener Chris Crowther Kirstyn developed her passion and knowledge of plants and planting design and this shows in her stunning planting schemes. With parents and Grandparents from the Lake District Kirstyn has grown up climbing the mountains and swimming in the lakes and rivers. It is here that Kirstyn developed a love for the environment and as a garden designer the surrounding landscape is an inspiration for Kirstyn’s designs. Utilising local materials and crafts, indigenous plants and relating the design to the natural surrounding landscape is key to the garden she designs.